A pumpkin beer tasting note on this fine All Hallow’s Eve. APPEARANCE: Clear, dark copper…the color of maple leaves on a crisp, late-October day. That’s fitting since the beer is actually an Oktoberfest/Pumpkin Ale mash-up. HEAD: A short, dense, off-white head that fades quickly into a tight crown. LACING: Nicely differentiated striations of sticky lacing. NOSE: Take notice other breweries…THIS is the nose your pumpkin beer should be striving for. It doesn’t smell like the brewer accidentally dumped an entire spice rack into the wort. Rather, the dominant note is sweet, Munich malt with the characteristic crisp, bready aroma of a good Oktoberfest. Layered on top of this foundation is the pleasant, but SUBTLE aroma of nutmeg, cinnamon, clove, and ripe pumpkin. It’s reminiscent of Thanksgiving without smelling like someone put a pumpkin pie in a blender and funneled it into a beer bottle. TASTE: Not as sweet as the nose implies…the bready, biscuity lager flavor is the dominant note. The spices are readily apparent in the flavor, but thankfully they take a back-seat to the big, Oktoberfest malt. Mash-ups can be tricky…sometimes one style overwhelms another or else the two styles simply don’t play off each other well. In this case, the Oktoberfest and Pumpkin Ale facets play beautiful music together…each complementing the other while letting their individual notes shine through. MOUTHFEEL: On the lighter side of medium-bodied with average carbonation. A little dry on the finish, but not astringent at all. DRINKABILITY: Despite the brilliant pairing of two great styles, the Pumpkinfest isn’t a particuarly complex or aggressive brew. It’s a Fall session beer with a very reasonable ABV and no cloying notes to keep you from enjoying one after another. A highly drinkable brew. RATING: 3.5 Hops…with this one, I’m trying to rate it within the style and it’s simply head and shoulders above most pumpkin beers on the market. 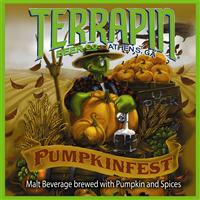 Posted in Tasting Notes.Tagged Halloween, Oktoberfest, Pumpkin Ale, Pumpkinfest, Terrapin.